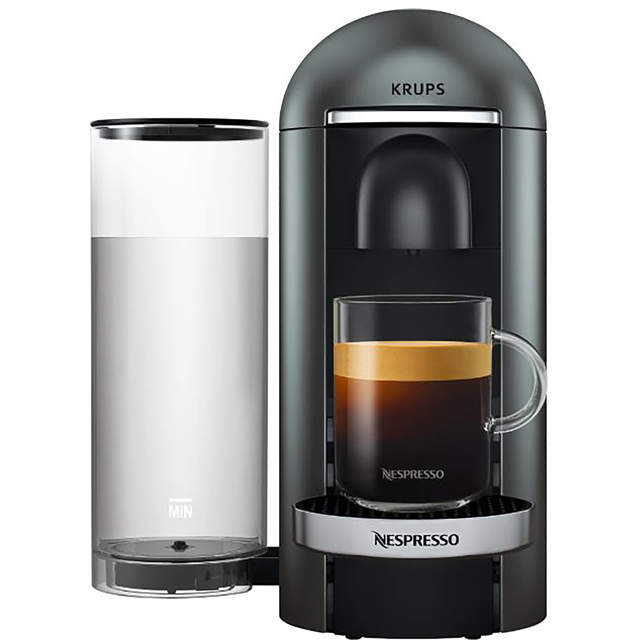 This Nespresso® Essenza & Milk coffee machine by Krups makes beautifully aromatic coffees with ease. It works with Nespresso® coffee capsules, so you’ll have a range of delicious flavours to try. 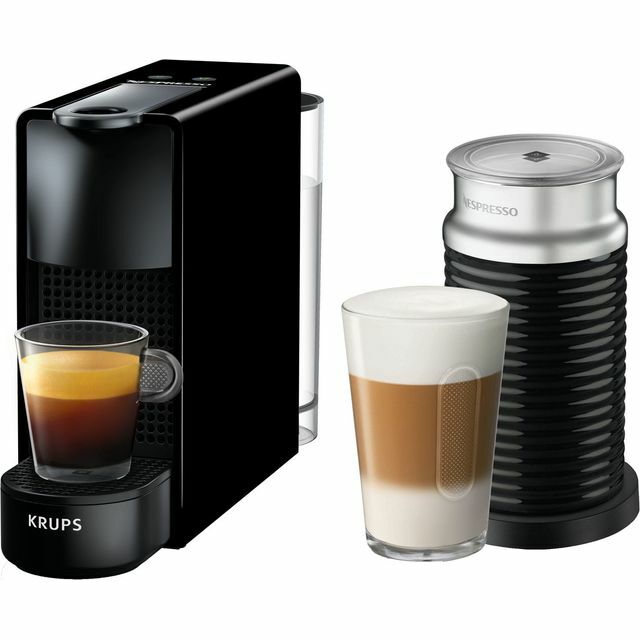 The Aeroccino system froths milk to perfection – ideal for adding that professional finish to drinks. The automatic stop function turns your machine off after 9 minutes of inactivity, so you’ll never have to worry about accidentally leaving it switched on. You can prepare drinks to suit everyone’s tastes with the programmable coffee size feature that allows you to make both espresso and lungo coffees at the touch a button. Register your machine online with Nespresso® to activate your warranty and join the Nespresso® Club for exclusive, member-only perks. With this coffee machine’s Aeroccino system, you’ll be able to add a luxurious, silky-smooth finish to every hot drink. With two whisks it works the milk to create a light and airy foam that can be added to your favourite coffees. This is perfect for making barista-style white coffees at home and giving every drink the perfect, professional finish. Nespresso Mini is the best thing we have purchased, it is so neat and in the corner of our kitchen it is there but not in your face, it works extremely well and smells even better, you wouldn't know you weren't in your favourite coffee shop when you make your favourite cuppa coffee, every one is delicious. A handy compact machine suitable for low duty daily use. Positives: Is compact and fits tidily on the work surface. I love the milk aerator, lovely to have a latte or flat white. Negatives: It's too short to fit a standard sized coffee cup or mug under so it involves using two cups! Despite the different coffee strengths, a lungo generally comes out quite weak and often 2 capsules need to be used. The temperature comes ready to drink so If you're adding cold milk you'll need to boil the kettle and top it up with hot water if you want a hot coffee else it's luke warm! Great machine. Chose the small one due to the size of our kitchen. Super happy with it as it simply does the trick. Milk frother has been life changing as well. Easy to use and clean. I love this !!! Delivered promptly. Website easy to navigate. Great coffee machine - great service. Our Nespresso was delivered speedily and on time. The price was very competitive, and the added bonus of the 150 free coffee pods direct from Nespresso was the icing on the cake. Perfect for those cold, dark winter mornings when you have to drag yourself into action.